Have TV Shows and movies like Lord of the Rings, Game of Thrones and The Three Musketeers caught your attention? Have you thought about exploring medieval pursuits? 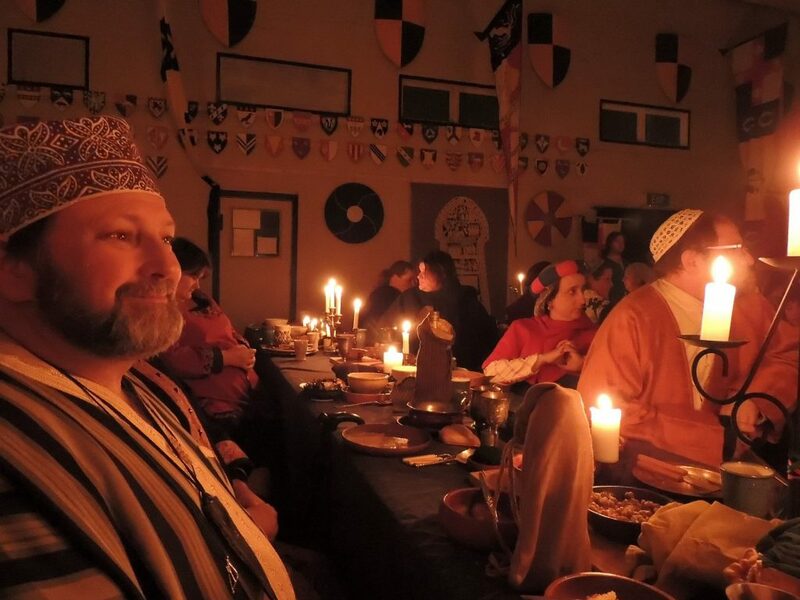 The Society for Creative Anachronism (SCA) is a world-wide historical recreation society with branches in the USA, Canada, Europe, New Zealand, Australia and parts of Asia. The Kingdom of Lochac covers Australia and New Zealand. The branch that covers all of Tasmania is called the Barony of Ynys Fawr. You’re welcome to come along to the Barony’s weekly get-together at Kraken Hall, the hall below the old grandstand at the Royal Hobart Showgrounds, Howard Road, Glenorchy. The activities start around 11am every Sunday. Check out the video made for ABC Radio’s Crazy Passions series. Dan (Sir Wulfgar) is one of the Barony’s two active Knights. You can meet him most weeks at Fighter Training on Wednesday nights, also at Kraken Hall. Our newcomer contact is Jackie Leitch, known in the Society by her chosen name of Lady Elena Anthony. Email her at chatelaine@ynysfawr.lochac.sca.org. She’ll answer your questions about this unusual pastime. Each Barony is led by a landed Baronage, who represent and advise the Crown. Again, in practice this is usually a Baron and Baroness, but not always – in Ynys Fawr we have two Baronesses. Their names are Liz and Nicole, but we call them by their SCA names, Her Serenity Adelindis filia Gotefridi and Her Exuberance Anna Felice Tavestoche. Groups are run by volunteer officers. The responsibilities of running a group do not rest solely with the Crown; there is a well-organised civil service to take care of the day-to-day tasks involved in ruling such a large organisation. Seneschals oversee the daily affairs; Marshals supervise the fighting and safety regulations; the Arts and Sciences Minister encourages the practice and research of medieval arts and sciences; and scores of other people keep the whole organisation running. 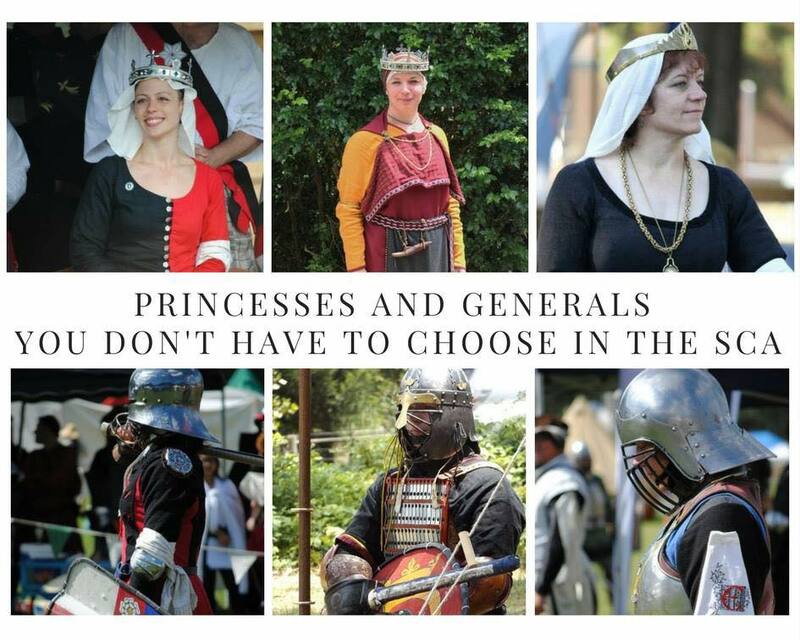 Members of the SCA strive to recapture the ambience of the Middle Ages, partially by researching such topics as dress, weaponry, armour, jewellery, food, and many other fields. This research is then put into action by constructing medieval-style artefacts, learning to fight, practising medieval arts and crafts, playing medieval games, cooking (and eating) medieval food, and more. Areas of interest are as varied as medieval culture. They include heraldry, manuscript illumination, archery, weaponry, armour-making, lacework, embroidery, dance and music, poetry, cooking, brewing, costuming, entertaining, board and card games, fighting, and much else besides. While many members of the SCA are involved (to a greater or lesser degree) in research, this aspect of the Society is by no means universal. Some of us simply enjoy “playing dress-ups”, or dancing, or fighting, or simple fellowship and have no interest in research at all. Others are fascinated by the details of history and become experts in topics most of the world has forgotten. People commonly get involved in the SCA for the fun aspects and then discover a desire to learn and do more. In addition to the historical aspects of research and re-creation, the SCA also strives to embody those lost ideals which are found in the medieval romances: chivalry, courtesy, honour, graciousness. We try to re-create the Middle Ages not as they were but as they should have been. We do not eschew refrigerators, modern medicine, hot and cold running water and sanitation, but we do try to leave the sexism and racism of the times out of our game. We call this living in the Current Middle Ages. All active SCAdians have a persona (more or less developed as the participant wishes). This is the creation of a personal character from an historic place and time. This persona cannot be an actual figure from history, so please don’t call yourself Anne Bolyen or Ethelred the Unready. It must be unique to the person bringing it to the event. It is certainly not necessary for newcomers to adopt a persona or medieval name at their first event, but it is fine if you wish to do so. 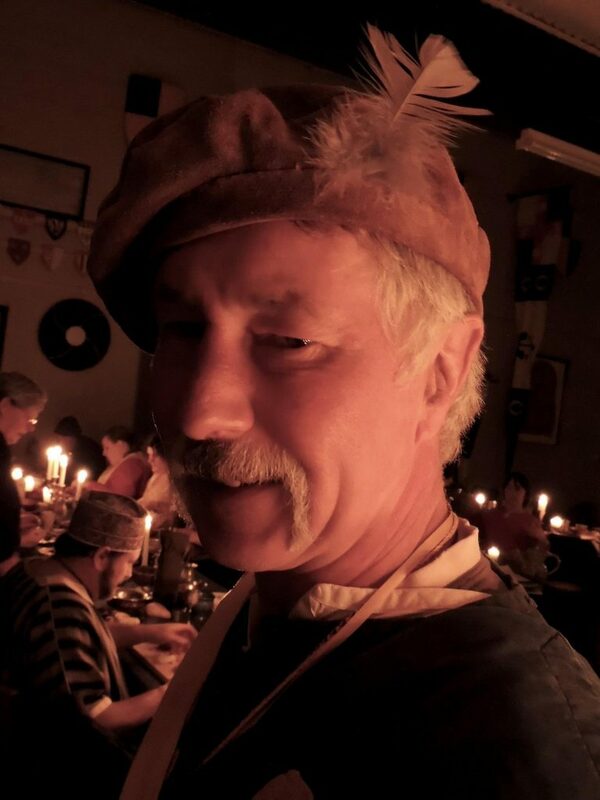 If you have always wanted to be a 6th century Celt or a 16th century swashbuckler, make up an identity from that period, research the culture of the time and place, and come as that identity to your next event. Our heralds love to help with this sort of detail. Just ask and you’ll get all the help you could possibly want! What is “period” in the SCA? The SCA’s period is officially any time before the end of the sixteen century. In practice, most of us hover around the 800-1600 range, but officially there is no start date, and there are plenty of members with interests and personas in cultures going back as far as classical Greece and Rome. What will I find at my first event? You will most likely find people who try to live by the ideals of respect, courtesy and personal honour. These are the ideals of the Society, and we address each other as “my lord” or “my lady”. There is an assumption that we all start at the level of lesser nobility and develop a ‘persona’ for ourselves. Thus we have Society names that are different from our real ones, to help create the Medieval atmosphere and leave the modern world behind, if only for a few hours. Everyone (including you) will be in medieval garb of some sort – from the simplest peasant tunic to the most elaborate court finery. Although historic accuracy is encouraged, we don’t get extreme about it. There’s nobody standing by to check that your underpants are hand-stitched from linen you grew yourself! “An attempt at pre-17th-century garb” is the way our rules have put it since the earliest days. There will be lots of wonderful food (whether the event is fully catered or pot luck). There may be dancing, game playing, singing, storytelling, swordplay, archery, competitions to enter; there will be new friends to meet and plenty of fun and relaxation. There will be people of all ages, families, couples and singles, and people from all walks of life who you might never have expected to see all in the one place. The SCA is is an equal-opportunity pastime. An attempt at medieval garb and courtesy is almost all that is required to attend. If you cannot organise your own garb, there is some available to borrow. As well, if you want to have a go at making something right now, the Arts and Sciences Minister should be able to direct you to some easy patterns – and feel free to impress and go all out if sewing is really your “thing”. Possibly the most important item of clothing you can make for yourself in the early days is a cloak. Under a cloak may be hidden a multitude of sins! It can be something as simple as a grey wool blanket thrown around your shoulders or as ornate as a full-length, fully lined, fur trimmed, hand woven cloak. A bowl (much more important than a plate as they can hold soup and stew as easily as carved meat or a baked apple) or two. Try to find something which is not glaringly modern. Carved wooden bowls are often available from op-shops and are totally acceptable. A goblet or other drinking vessel: again, nothing glaringly modern. A spoon can be an important piece of cutlery. Forks are either late period or Byzantine, but they are acceptable. Daggers are, of course, the one of the oldest eating utensils and were used to both cut up food and to transfer it (carefully!) to the mouth. Candles and candle sticks. Because we do not use modern lighting at events where it can be avoided, everyone should bring at least one candle and candle stick to an evening event, and preferably more. Something to drink – beverages are often not supplied and dancing can be very thirsty work. Try to keep that plastic bottle out of sight or hidden in a cloth or bag. If the event is fully catered this is all you will need. If the flyer says that the event is a pot-luck, each person is expected to bring a dish suitable to share. If you want to bring something a bit more interesting than a barbecued chicken from the supermarket, there are lots of period recipes available. Again, talk to the Chatelaine. Do I have to speak “forsoothly”? No, that’s a bit silly. Just avoid talking about modern topics like TV, computers and politics and you’ll be fine. Talking about period politics is perfectly fine, of course! How about that King Henry, eh? What a man! How should I address people? The basic rule which will get you through nearly everything is to call everyone “My Lord” or “My Lady” as appropriate. There are, of course, complicated rules about titles and forms of address, but they’re nowhere near as important as most people expect. If you chance to address the Queen of Lochac by the title “My Lady”, that’s perfectly fine, even though she will probably have a dozen other official titles. Yes, absolutely. 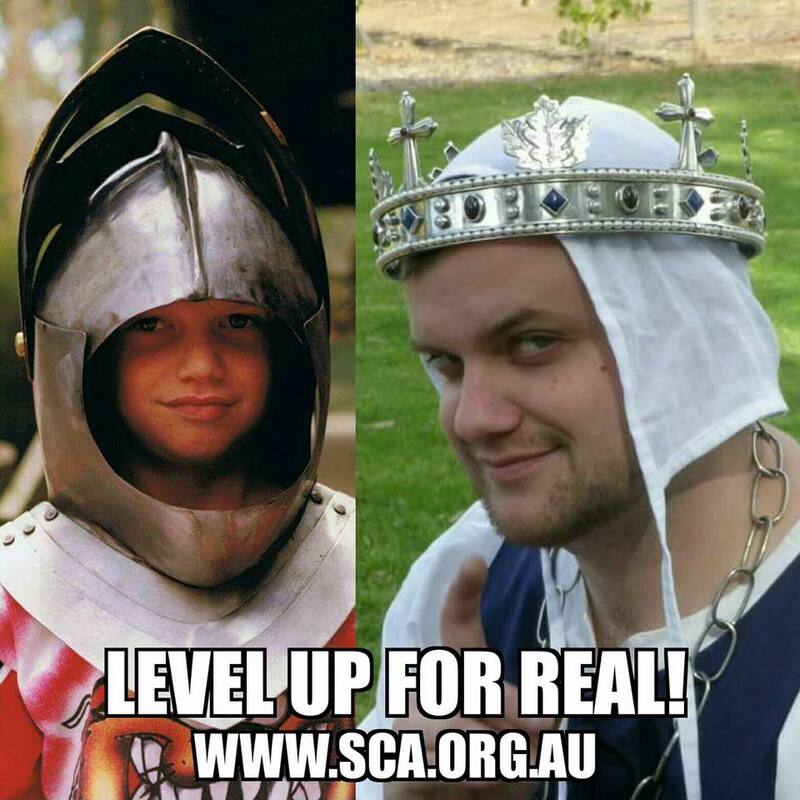 The SCA is a game for children of all ages, both those young in body and those who are only young in spirit. Prices are usually lower for kids too, to encourage you to bring them along and get them involved. I have food allergies/I am a vegetarian will I find anything to eat at an event? Contact the steward and tell them of your particular requirements – they will try very hard to accommodate you. Even if you don’t inform them, you may well find enough to eat because the Barony prides itself on feeding everyone, but you’ll be taking the foolish risk of not having as much excellent food as you might have. As always, communication is the key. I am disabled, will I still fit in? Absolutely, but you may need to check to make sure that you can get onto a given site if you are in a wheelchair or have some other mobility problem. If it looks as though this could be an issue, tell the steward and he or she may be able to come up with a solution. As well, if the steward knows about your disability he or she can have it mentioned at the beginning of the event, if you wish, so that people know to leave the guide-dog alone, to face you directly when talking to you, or whatever it is that you need to help you enjoy the experience as fully as possible. Do not worry that your wheel chair (or any other aid) isn’t period, we are not such purists that this matters. Who knows, you may come up with a way of “periodising” your accessory that no-one else has invented (or even be able to enter it into a competition as once happened with a tabard made for a guide-dog!). So, please, don’t feel afraid to come along and give us a try, you may well find that the Society fits you perfectly! I am a woman; can I be a fighter? Yes! We have a quite a few respected women fighters in all fields of combat. The Kingdom currently has three female knights, and they won’t be the last. If you don’t feel comfortable with wearing full armour and thumping people with (rattan) swords, then you could think about fencing or archery. Do I have to join the Society? Not exactly. You can pay an annual membership, which is currently $35 per adult and free for kids in their care, but you don’t have to pay to play. If you don’t become a member, we have to charge you a $5 “day membership”, which goes to our insurer. That applies to all events and activities, so it can add up: go to more than one thing every second month and you’re better off becoming a member. Do I have to spend a fortune to get involved in the SCA? Some people do, its true, but most of us don’t. 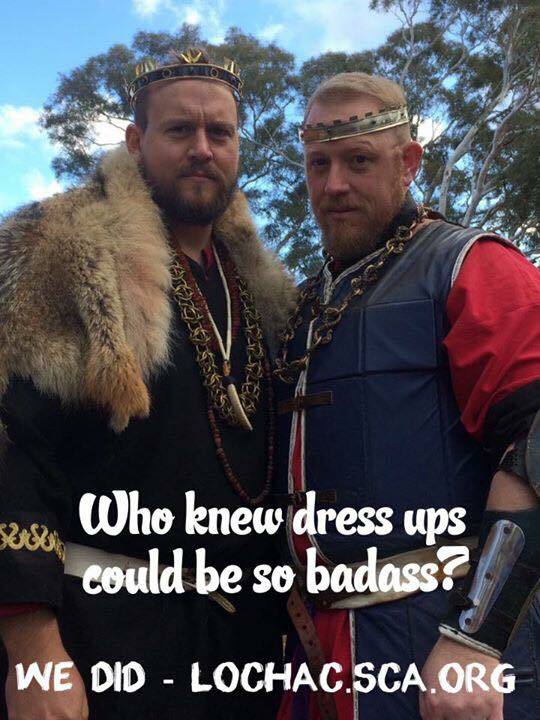 We have members in the Barony who can create the most astonishing garb and feasting gear entirely from op-shop finds and “junk” on GumTree. Others spend considerable amounts commissioning just the right look from artisans all over the SCA. How much you spend is really up to you; please remember, though, that the Society is supposed to be fun so don’t spend more than you feel able to do. Come along to an event or activity: check the calendar for the latest. If you want to get to know people first, take a look at our Facebook group: it’s pretty active. Then, when you find something you like the sound of, jump in. You will be quite welcome! This is perhaps the most important word in the Society. It could save you from serious harm – or from harming someone else. “Hold!” is a cry meaning “stop whatever you’re doing and freeze in place until you see where the hazard is!” The basic use is in combat, but it’s been extended to cover all forms of activity. It’s often the first word learned by children born into the SCA. If you hear someone shout “Hold!”, stop dead – your foot may be about to land on a wasp nest. That’s it! You know know all you need to know. What are you waiting for?